Home FitnessRunning The Dilemma of Upcoming Races and Not Progressing as a Runner! Summer hibernation is over! ADHM and SCMM are opening their registration doors… and the running community at large is hitting back the roads: the winter season is coming!!! Now is the time to plan: think targets, look for training programs. So, it is a good time to review some of the typical mistakes that can be seen in training. To make it easy to understand (and a bit fun), we will use the “Case study” method: to depict some behaviors, and to draw some conclusion. ANALYSIS: Jokes apart, this kind of training has the risk of over doing it, of doing too much and getting injured. Perhaps, if it is combined with good strengthening in the gym, there would be no injuries. But then, the problem could be under-recovery, reaching the starting point too tired as said. Perhaps it is possible to reach the target for HM, but while trying to move forward to Full Marathon this approach will lead to the famous Wall and there will be no improvement. The solution is not to train harder but smarter, to realize that training plans are not based on pace: on fixing a given pace (the target pace) and increase the distance gradually but in distances: they are fixed and the pace is improved gradually. A person training for 1:45 HM will run all the long runs at the pace of 5:30 or slower!! Depending on the plan, he/she will require to run at the most “only” 2/3 of the HM at the target pace of 5:00. Terms like “Anaerobic” and “Aerobic” are crucial but there is no space here to develop them. CASE 2: The second type is the “supergirl”, she is a multi-tasking person, shifting easily from home-matters, to work-matters, to friends-matters… handling everything quite successfully, she is hardworking – likes to organize all “tasks” and finish them quickly; and running is another task. Her target is to finish the HM in 2:30, but she doesn’t have time for math, numbers and the like, so she just goes and runs, putting all she has in every run depending on the mood of the day. Looking at how she runs… it is not clear if she wants to finish the HM in 2:30 hours or in 2:30 minutes!!! She does the first kms quite fast and towards the end slows down drastically. At the end, she will check her timing only to answer one question “I am above or below 2:30?” She may hear here and there some runners speaking strain words like “intervals… tempo…” which doesn’t make any sense to her! She doesn’t have the time to get into technicalities!! She may figure out that she should change pace and run different days at different pace… but it won’t happen: at the most there would be few seconds different in the first km, after that… back to same. She may not see much improvement as the weeks pass by, she may get a bit anxious “will I make it, or not?” The race day she will start too fast like trying to save time… she will be worn out by half way and… may not make it. ANLYSIS: What is represented here is a person similar to the first, even though it is not driven by a given pace like the “Rambo” but the training-log will look similar: almost all the runs done at similar pace, and therefore no much improvement. This kind of runner needs to put a bit more interest in the “why’s” of the program, to understand the different intensities of the different work-outs and to follow them: for example, when it says “easy run” then get a lot of patience and go easy. Patience is key because results don’t come immediately. CASE 3: The third character can be called the “wind vane runner”. He is not having any plan, he is not following any schedule, he just goes and runs as per the wind of the day, or the whim of the moment. 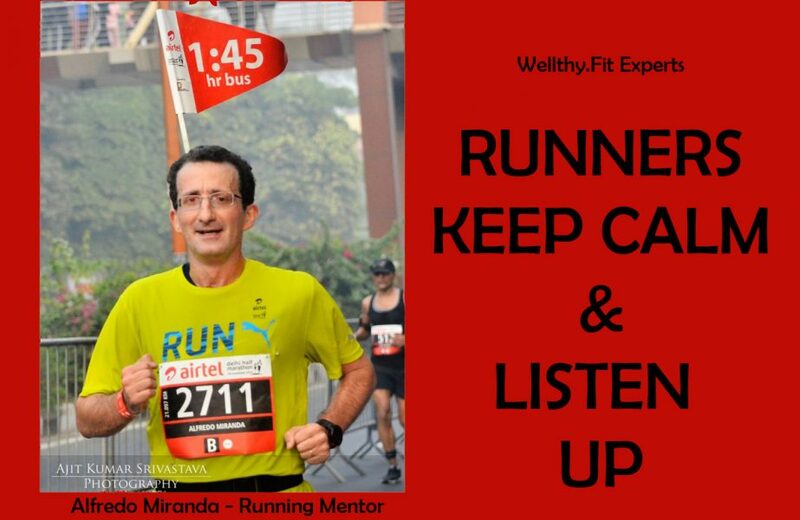 He joins other runners as per the plans coming up in Facebook, in WhatsApp or similar. More concerned with who is there than what’s the plan or how fancy the plan sounds “Hill repeats + paranthas: WOW, that sounds great!!! Let’s do it! !” The chaotic running may be a source of injuries, but most probably the stamina will be gone before the injuries come, so there is less risk in this front. However, there will be no progress in the running and on Race Day all his mates will finish faster than him and he will feel a bit “out of place”. ANALYSIS: The famous “run for fun: forget about timings! !” is a very legitimate option: nothing to object to it. How we approach running is a personal matter and all the options are valid, as long as you don’t put your health at risk, meaning: “don’t go for a 400km race without training”. The point is to understand that without a proper training plan we will improve up to certain limit, depending on our physical conditions, and then we will reach a “plateau” where we will be comfortable with our pace and we will do no much improvement, despite being running every week. Again, this is fine as long as it is what you want, but then be consistent and… don’t complain that others are getting better!! If you decide to improve, then you need to come out of your “comfort zone” and stick to a program, then results will come. But this is not a “black and white” issue, there are plenty of “greys”!! It is possible to just introduce a bit of order in your running, alternating those “fun” runs where you forget about timings and the like, with some specific runs which will help to reach certain improvement. Active in sports since childhood, he ran his first Half Marathon on 2004 out of a bet at office. However, it was only in 2011 when he took running more regularly. Following his natural tendency for “how this works?” he kept on exploring, reading, testing, making mistakes… looking for ways to improve… It came natural to share his discoveries with other runners, by now he has been mentoring people from 10K to 200+ km’s ultra-running. He keeps alternating his own runs with pacing for others.